Today we look at how, in his column this week, Jack Kelly (conservative columnist at the Pittsburgh Post-Gazette) rehashes a debunked by more than a year conspiracy theory about, you guessed it, Presidential Nominee Hillary Clinton. Donald Trump will run as if he were in a Democrat primary. 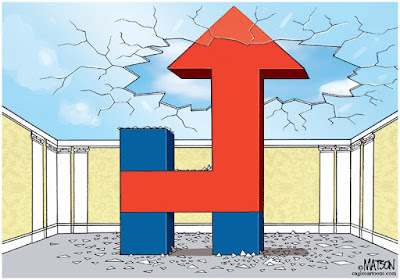 He’ll be to Ms. Clinton’s left on some economic issues, in sync on most social issues. He’ll aim his pitch at Sanders backers and the white working-class that Democrats have abandoned. This strategy comports with Mr. Trump’s political views, such as they are. 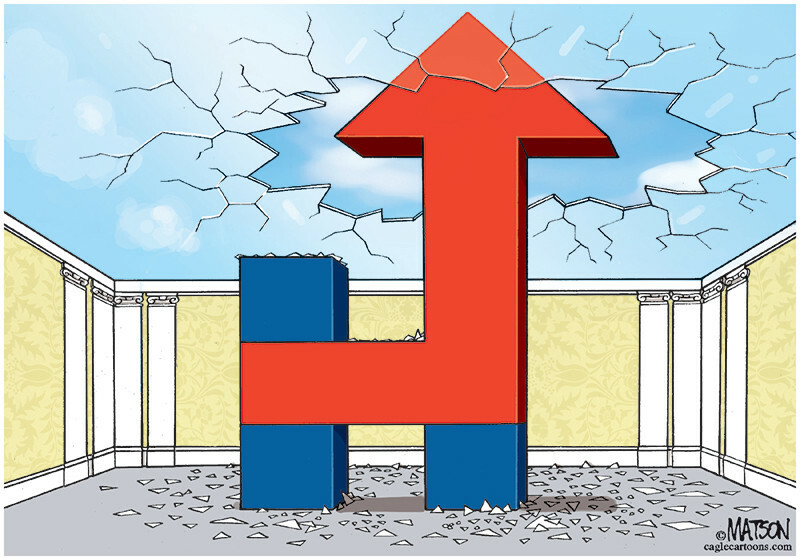 It will discombobulate Ms. Clinton, who doesn’t respond well to the unexpected. Trumpkins will applaud whatever he says. Republican “leaders” are too ethically compromised to complain. For the record, that was Jack Kelly calling Trump supporters "morons." The FBI thinks Russian intelligence hacked the DNC emails. Ms. Clinton turned over fewer than half the emails she sent through her private server while she was secretary of state. Odds are the Russians have the ones she didn’t. That’s bad news for Ms. Clinton, because the Russians have a powerful interest in electing Donald Trump. He has a man-crush on Vladimir Putin and has indicated a willingness to dismantle NATO, Mr. Putin’s foremost foreign policy objective. The gaps in Ms. Clinton’s email record coincided with meetings with shady foreign characters who got favors after making megabuck contributions to the Clinton Foundation, noted Peter Schweizer of the Government Accountability Institute. Few Americans know how badly Ms. Clinton has harmed national security. Most would be appalled by evidence that she may have solicited bribes. Let's take a look at the source of this smear: Peter Schweizer (of the Government Accountability Institute). Who is this guy? The way Jack describes him, he sounds politically neutral, right? Some sort of apolitical guv'ment watch dog who can be trusted to call the balls and strikes fairly, right? Peter Schweizer is the William J. Casey Fellow at the Hoover Institution, Stanford University and a best-selling author. He is a partner in the Washington, D.C. firm Oval Office Writers which provides speechwriting and communications services for corporate executives and political figures. By the way, I tried to find out something (ANYTHING) about this "Ultraterrorism Study Group" at the Sandia National Lab. Interestingly, I couldn't find any reference to it that wasn't included in a Peter Schweizer bio. Try it yourself: google ["ultraterrorism study group" -schweizer] and you won't find ANY references to speak of. At this writing, I'm seeing one that includes a misspelling of his last name and others that are obviously spam. Works the same if you include type the word "ultra-terrorism". Was there an "ultra terrorism study group" at Sandia? And if so who else was on it? And if it existed the way Peter Schweizer wishes us to believe it existed, WHY CAN'T I FIND ANYTHING ABOUT IT ON-LINE? Is everything except Peter Schweizer's participation in the group a state secret? Please, if I am incorrect and there is some credible findable information about this Sandia committee that Schweizer says he was a part of, please email it in. I'll post an update. I want to be incorrect. I don't want to have found out that this guy lied about his own bio and has been lying about it for years. Anyway, he's also the guy who wrote the roundly debunked smear on the Clintons, called Clinton Cash. Wait, did Jack really not tell us that there were eight other members of that committee that also had to agree with a sale that eventually went through? Schweizer: Well, here’s what’s important to keep in mind: it was one of nine agencies, but any one of those agencies had veto power. So, she could have stopped the deal. And that's what Jack based his story of Clinton Corruption. A smear that was debunked 15 months ago. WHY CAN'T ANYONE AT THE P-G FACT-CHECK JACK KELLY? This has gotta be embarrassing for the staff at the Post-Gazette - knowing they're pulling down a paycheck from the same folks who both a) pay Jack Kelly and b) can't keep him from making a fool of himself in print. Let me ask you [Mr Trump], have you even read the U.S. Constitution? I will gladly lend you my copy. Folks, let me say, let me say something that has nothing to do with politics. Let me talk about something that I'm deadly serious about. This is a complicated and uncertain world we live in. The threats are too great, the times are too uncertain to elect Donald Trump as President of the United States. Now Let me finish. No major party, no major party nominee in the history of this nation has ever known less or has been less prepared to deal with our national security. We cannot elect a man who exploits our fears of ISIS and other terrorists, who has no plan whatsoever to make us safer. A man who embraces the tactics of our enemies, torture, religious intolerance. You all know. Other the Republicans know - that is not who we are. Donald Trump betrays our values. For a full (though not official) transcript, go here. Labels: first woman presidential nominee, Hillary Clinton, historic, Yes! Note: these are not the ONLY reasons nor are they necessarily the BEST reasons - I am assuming this list will be updated from time to time. He's a climate science denier. While the first two are simply products of a stubborn politically-enforced intellectual inactivity (to put it nicely), let's all remember that waterboarding is torture and that torture is a war crime. The GOP candidate for the Oval Office has advocated committing war crimes. That alone disqualifies him for the highest office in the land and should have disqualified him from the start. Sarah Silverman, Bernie Supporter, Said This Tonight. To the Bernie or bust voters: You’re being ridiculous. And she's right. With each new tantrum, they're making it easier for a Trump Presidency. This one has been bouncing around in my head for some time, forgive me. A few weeks ago my BFF, columnist Colin McNickle, wrote this piece at my absolutely positively favorite news source in the entire galaxy (it's true - believe me), the Tribune-Review. And in it he very subtly misquotes his main foundation/source - United States Supreme Court Justice Joseph Story. It's interesting to note that a columnist for the conservative/libertarian Tribune-Review would be so enamored of a Justice "deeply committed to a strong national union" but there you have it. Strange bedfellows and all that. His appointment to the Court came after three other nominees, including John Quincy Adams, had either declined the offer or failed to win Senate confirmation. Wait, The Senate voted on the nominees back then? Within days?? Did you know this Senator Toomey? Anyway, in 1833, Story published his Commentaries on the Constitution of the United States, from which Trib columnist selectively selects his snippets to bolster his pro-gun argument. And yet, though this truth would seem so clear, and the importance of a well regulated militia would seem so undeniable, it cannot be disguised, that among the American people there is a growing indifference to any system of militia discipline, and a strong disposition, from a sense of its burthens, to be rid of all regulations. How it is practicable to keep the people duly armed without some organization, it is difficult to see. Regardless of what you (or I) might think of the Second Amendment's meaning, do you really think Joseph Story was talking about an individual's right to own weaponry rather than a State's right to a militia made up of citizen-soldiers? Story is obviously talking about a "well regulated militia" as the "natural" defense against tyranny and complaining how there was (even then) a growing indifference to any sort of "militia discipline" and strong disposition "to be rid of all regulations." My my - plus ça change, plus c'est la même chose, I suppose. This leads me to McNickle's biggest sin. Take a look at the context into which he places Story's last sentence. It's a discussion of "the people's" right to revolution. That's where McNickle writes about indifference going to disgust and then to contempt. Now take a look at where Story actually uses the word "indifference." It's in two places; "the growing indifference to any system of militia discipline" and then the danger that it leads to disgust and so on. Story is NOT talking about any sort of revolution there is he, Colin? You mis-represented your main source didn't you, Colin? Isn't that kind of a bad thing to do when you're a columnist? I'm just asking. Republicans mourned the Grand Old Party after presidential nominee Donald Trump gave his acceptance speech at the 2016 Republican National Convention on Thursday. Nicole Wallace, communications chief under former President George W. Bush, didn’t mince words after Trump spoke. “The Republican Party that I worked for for two decades died in this room tonight,” Wallace said on NBC. A small group of veteran Republicans who are die-hard Donald Trump opponents gathered Thursday evening to mourn ― and effectively protest ― a party they no longer recognize. TRUMP CLAIM: My opponent wants to essentially abolish the 2nd amendment. THE FACTS: Clinton has proposed gun regulations, like background checks to purchase firearms. Yet the 2008 Supreme Court decision protecting and individual's right to possess firearms also stated that the right isn't unlimited — and can be subjected to regulations. TRUMP CLAIM: Homicides last year increased by 17 percent in America's fifty largest cities. That's the largest increase in 25 years. THE FACTS: Trump is correct that there has recently been an uptick in crime, including in some (but not all) of America's largest cities. But overall, violent crime is down significantly since the 1980s and 1990s, according to FBI statistics. And the current violent crime rate is lower today per the most recent data (365 incidents of violent crime per 100,000 people) than when President Obama first took office in 2009 (431 incidents per 100,000 people). Sad to see how low this once dignified party has sunk - but let's not forget, that by courting 2-3 decades of fact-free demagoguery (Rush Limbaugh, Jerry Falwell, the Tea Party) the GOP has only itself to blame. Let's hope we never ever see that again. GOP Convention Day Four Theme: "Tomorrow Belongs to Me"
Looks like the focus group of delegates are eating it up! Can't wait to see Trump enter to this! As per the program notes for the evening, directly after Trump gives his speech, Hillary Clinton -- having been tried in absentia and found guilty by potential Attorney General Chris Christie -- will be dragged into the Quicken Loans Arena where her head will be shaved and she'll be "shot for treason." We all know that GOP Presidential Nominee (and husband of a well-known Slovenian plagiarist), Donald Trump thinks that climate science is a hoax. But what about his Vice Presidential nominee? He's also a climate hoaxer - from way back in 2001. Warmer to much-warmer-than-average conditions dominated across much of the globe's surface, resulting in the highest temperature departure for June since global temperature records began in 1880. This was also the 14th consecutive month the monthly global temperature record has been broken—the longest such streak in NOAA's 137 years of record keeping. The June 2016 combined average temperature over global land and ocean surfaces was 0.90°C (1.62°F) above the 20th century average, besting the previous record set in 2015 by 0.02°C (0.04°F). June 2016 marks the 40th consecutive June with temperatures at least nominally above the 20th century average. 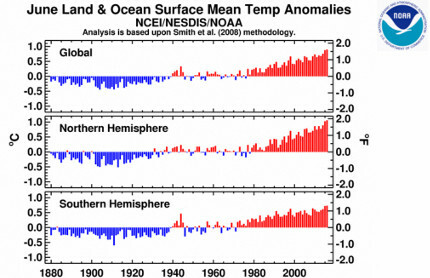 The last time June global land and ocean temperatures were below average was in 1976 (-0.07°C / -0.13°F). Warmest June since temperature records began in 1880. Something else to think about come November. Which party agrees with science and which doesn't? The hypocrisy of liberal state attorneys general in their pursuit of climate change “deniers” and, specifically, ExxonMobil, is on stark display in their bitter response to subpoenas served by the House Science Committee. And while the same AGs suggest racketeering by those who dare to question the “settled science” of climate change, they, themselves, colluded with environmentalists, who briefed them on prosecuting the “deniers,” The Times reports. Free speech on climate science is not the malicious “fraud” that the AGs make it out to be. They should exercise their own First Amendment right, preferably before the House Science Committee. Like most everything else you say about climate change, you can keep saying it but that doesn't make it true. Guys, you know we've been here before. As far back as the late 70s, Exxon knew the science was right and yet within a few years began to fund the "think tanks" that would sow doubt into the minds of the gas-purchasing public in order to keep the profits going. That's fraud. Fraud is not a free-speech issue. I guess Jack learned nothing from this column from last September. Then, he was repugnant regarding the echoes of slavery. This time it's Black Lives Matter. Hm, I'm wondering if there's a common thread here triggering Jack's disgust. Something that connects or otherwise overlaps those two issues - the first regarding the current effects of the past enslavement of African-Americans (aka "black people") here in Amurika and the second a movement formed to protest (among other things) police brutality called Black Lives Matter. Hm. Thinking. Pondering. Wondering. WHAT COULD THOSE TWO ISSUES POSSIBLY HAVE IN COMMON THAT JUST MIGHT HAPPEN TO BOTHER POST-GAZETTE COLUMNIST JACK KELLY SO MUCH?? I think I know but I won't say because I could be wrong (but I don't think I am - in fact, I doubt even Wendy Bell could miss it). To assign the actions of one person to an entire movement is dangerous and irresponsible,” said Black Lives Matter after five Dallas police officers were killed during a BLM protest by a black man who was upset over recent incidents in which police officers killed black men. BLM doesn’t practice what it preaches. Neither do President Barack Obama or most in the news media. It’s also dangerous and irresponsible to jump to conclusions when black men are shot by police. The shootings of black men in Louisiana and Minnesota “are symptomatic of …the racial disparities that appear across the [criminal justice] system year after year,” Mr. Obama said. But the more we learn about those shootings, the less it appears they were racially motivated. Interestingly Jack tries to dance the data-dance, too! In what he said was “the most surprising result of my career,” Harvard professor Roland Fryer, who is black, found no evidence of racial bias in his study of shootings in 10 major police departments, although he did find that blacks were more likely to be cuffed or roughed up. The results obtained using these data are informative and, in some cases, startling. Using data on NYC's Stop and Frisk program, we demonstrate that on non-lethal uses of force - putting hands on civilians (which includes slapping or grabbing) or pushing individuals into a wall or onto the ground, there are large racial differences. In the raw data, blacks and Hispanics are more than fifty percent more likely to have an interaction with police which involves any use of force. Accounting for baseline demographics such as age and gender, encounter characteristics such as whether individuals supplied identification or whether the interaction occurred in a high- or low- crime area, or civilian behaviors does little to alter the race coefficient. Adding precinct and year fixed effects, which estimates racial differences in police use of force by restricting to variation within a given police precinct in a given year reduces the black coefficient by 19.4 percent and the Hispanic coefficient by 26 percent, though both are still statistically larger than zero. Including more than 125 controls available in the data, the odds-ratio on black (resp. Hispanic) is 1.173 (resp. 1.120). To Jack, that was worth 10 words. Our results have several important caveats. First, all but one data set was provided by a select group of police departments. It is possible that these departments only supplied the data because they are either enlightened or were not concerned about what the analysis would reveal. In essence, this is equivalent to analyzing labor market discrimination on a set of firms willing to supply a researcher with their Human Resources data! There may be important selection in who was willing to share their data. The Police-Public contact survey partially sidesteps this issue by including a nationally representative sample of civilians, but it does not contain data on officer-involved shootings. Relatedly, even police departments willing to supply data may contain police officers who present contextual factors at that time of an incident in a biased manner - making it difficult to interpret regression coefficients in the standard way. So the data used might be accurate but (maybe) not indicative of the whole picture OR it might not be reliable. Fryer was quite explicit about the fact that his data were specific to Houston and more data are needed in order to understand whether police shootings are racially biased in other parts of the country. Did Jack tell you any of that? No, he didn't. It could've put some nuance and context in this us-versus-them, black-and-white column. He could have put it there, but he didn't. He doesn't want nuance. He doesn't want context. And now you should ask yourself why. When Mr. Obama was elected, the silver lining in the cloud I saw descending on America was that the election of the first (half) black president might promote racial healing. But he’s been the most racist president since Woodrow Wilson. For every black person killed by a white cop, 71 blacks are killed by other blacks. The real tragedy is that so many blacks must live in inner-city neighborhoods where gangs run riot, schools are terrible, jobs are scarce. Whites aren’t to blame for the terrible conditions in which so many blacks live. Those at fault are local government officials (Democrats mostly), politicians in Washington whose policies hurt black families (Democrats mostly), and blacks themselves. Problem solved! Racism in this country isn't the fault of anyone other than the Democrats who run things locally and nationwide AND blacks themselves! And the (half) black president is also to blame for not cleaning up 600 years the mess in a measly 8! Can Jack Kelly be any more of an embarrassment to the P-G? In preparation for their convention this month, Democrats are taking aim at so-called “climate deniers.” Lending a hand is the father of the long disputed “hockey stick” global-temperature graph, who now says facts no longer are necessary to substantiate the climate change story line. They're going after Mann's hockey stick? AGAIN? Don't they know that their use of the word "disputed" is simply not supported by the scientific facts? People can simply see the outcome of man-made emissions, says Michael Mann, director of the Earth System Science Center at Penn State. Climate models “increasingly are unnecessary,” says the climate researcher, because the manifestations of climate change are “playing out in real time.” Would these be the same climate models used by the United Nations Intergovernmental Panel on Climate Change, which have been consistently wrong? Ah...the computer models. To the rightwing pundits, they don't work. Climate models are unmatched in their ability to quantify otherwise qualitative hypotheses and generate new ideas that can be tested against observations. The models are far from perfect, but they have successfully captured fundamental aspects of air, ocean, and sea-ice circulations and their variability. They are therefore useful tools for estimating the consequences of humankind's ongoing and audacious planetary experiment. Mr. Mann, who has sued a number of his critics for defamation, this spring acknowledged the early 2000 “warming slowdown.” He now says that climate change is obvious in hurricanes, flooding and droughts in different parts of the United States. Wait..."slowdown"? Not "stop" or "pause"? Doesn't that mean that warming continued but at a slower pace? Doesn't that mean that the braintrust acknowledges the warming?? But just last year the NASA Goddard Institute for Space Studies reported that the nine-year reduction in Category 3 hurricanes, starting in 2006, beat the previous record of eight years in 1861-68. Wouldn't that suggest that temperature patterns are cyclical rather than influenced by human activity? Yea, let's go to the facts. The "nine year reduction" is not a global phenomenon but a local one. The United States hasn't experienced the landfall of a Category 3 or larger hurricane in nine years — a string of years that's likely to come along only once every 177 years, according to a new NASA study. "The last nine hurricane seasons were not weak — storms just didn't hit the U.S.," Hall said. "It seems to be an accident of geography, random good luck." So what Scaife's braintrust uses as evidence against, really isn't evidence for anything at all. Goshers, that's embarrassing. But isn't that how they argue climate science over there at the Trib? Meanwhile, it's still warming up outside and we're still to blame. No amount of right wing propaganda is going to change that. Someone please, make her stop! It is a remarkable picture. A single woman stands in the roadway, feet firmly planted. She poses no obvious threat. She is there to protest the excessive force which Baton Rouge police allegedly deploy against the city’s black citizens. She stands in front of police headquarters, on Saturday. 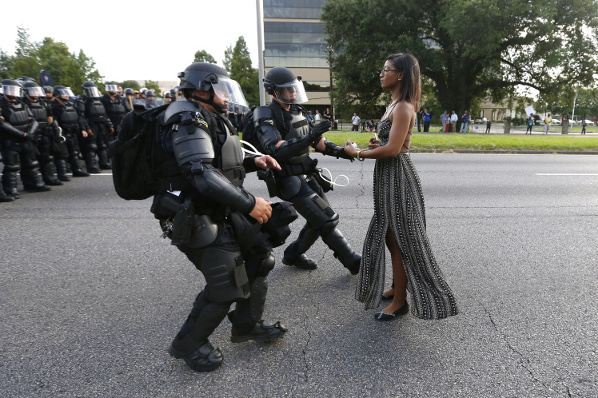 And she is being arrested by officers who look better prepared for a war than a peaceful protest. With this week's column in the Pittsburgh Post-Gazette, columnist Jack Kelly tries, yet again, to dance the Benghazi dance. Didn't he realize that he was in trouble with his beginning sentence? We used to expect more of our presidents than that they not have been indicted for felonies. Yea like waterboarding, eh Jack? Torture, according to Merriam-Webster, is "the infliction of intense pain (as from burning, crushing or wounding) to punish, coerce or afford sadistic pleasure." Federal law defines torture as "severe mental or physical pain," and mental pain as "prolonged mental harm." Because waterboarding inflicts neither physical pain nor prolonged mental harm, it isn't torture, said the Justice Department during the George W. Bush administration. Anyone want to guess how much agony and/or waterboarding causes? If there's any, then Jack lied to all of us 3 years ago about waterboarding. And yet, Jack Kelly said waterboarding isn't torture. Why should we trust him on anything? But let's move on to this current perspiring pile of fetid feculence. Which is curious because while he probably got this quotation from Breitbart (or some such right wing "news" source), if you took a look at the Breitbart piece, the link is to the Democratic Benghazi report (the one issued a few days before the Republican report). The source of quote has been named "Agent B" and did you know Agent B wasn't posted at Benghazi at the time of the attack? Did you know he was there about 10 months earlier concerning the security situation there about a year before the Benghazi attacks? If that's even something Jack Kelly knew, it was something he decided to tell you. Think about the two possibilities. Either he didn't know the context of the quotation he was using (bad, Jack!) or he did and he chose not to tell us (very bad, Jack!). The Select Committee did not interview the DS Desk Officer referred to by Agent B, but that official was interviewed by another congressional committee in August 2013. Although he never described that specific conversation in his interview, the DS Desk Officer confirmed that Deputy Assistant Secretary Lamb was responsible for the decision to provide only three DS agents. Huh. Jack didn't tell you that either, did he? The Fleet Anti-Terrorism Security Team in Rota, Spain, probably could have gotten there before former Navy SEALs Tyrone Woods and Glen Doherty were killed. But its departure was delayed while officials, including Ms. Clinton, bickered over whether the Marines should wear their uniforms. The Marines changed clothes four times. Look carefully at that passage. Nothing about Sean Smith or Ambassador Stevens, right? And were there other delays than the Marines changing clothes? Let's to to the Republican report on just this subject. One of the FAST platoons ordered to deploy by the Secretary arrived in Tripoli at 8:56 p.m. local time [2:56 p.m. in Washington D.C.] the evening of September 12, nearly 24 hours after the attacks began. 456 As military witnesses have posited on many occasions, the mission of a FAST Platoon is not hostage rescue but to “put that layer of steel around a critical infrastructure of the United States to say to our enemy, ‘ Don’t mess [with us].'" Wait, the FAST platoon is not a hostage rescue team? But didn't Jack Kelly, former "National Security" correspondent at the P-G just say that the team "probably could have gotten there" before Woods and Doherty were killed? What for, if not as a rescue team? But let's go deeper into the timeline, shall we? Let's see if what Jack so casually wrote was even possible. The attack begins shortly before 10pm (Libya time) on September 11, 2012. 10:30 p.m.: Stevens and State Department information management officer Sean Smith have taken refuge in the main building in the compound, behind a fortified door with metal bars that keeps the attackers from breaking in. But the militants set fire to the building. Within minutes, Stevens and Smith are overwhelmed by smoke. 1 a.m.: A U.S. rescue team arrives in Benghazi from Tripoli, Libya’s capital. Nearly 30 Americans are rescued from the compound. Shortly thereafter, Stevens is taken to Benghazi Medical Center and pronounced dead on arrival, according to a hospital source. 4 a.m.: Gunmen launch an assault using mortars against the CIA annex. Glen Doherty and Tyrone S. Woods, both former Navy SEALs, are killed. Sometime between midnight and 2:00a.m. Benghazi time, Secretary of Defense Leon Panetta verbally ordered two Marine Fleet Antiterrorism Security Teams (or "FAST platoons") to deploy from their base in Rota, Spain, to Libya. Between 2 and 4 hours before the mortar attack that eventually kills Woods and Doherty at the CIA annex. One team was to go to Benghazi, the second to Tripoli. However it would take 96 hours for the Tripoli team to arrive. Because all Americans were evacuated from Benghazi before the first FAST platoon could arrive, it was diverted to protect the U.S. Embassy in Tripoli and arrived at 8:56p.m. Tripoli time, 011 September 12, 2012. You'll note that the Post timeline says that at 1am a rescue team from Tripoli was able to secure 30 at the compound. This would be within an hour (in either direction) of Secretary Panetta ordering the FAST platoon to deploy. The FAST Marines, who were based out of Rota, Spain, were ready to leave for Libya at 5:45 a.m. local time the morning after the attack, the team's platoon commander told the committee. The Marines waited six hours for Air Force C-130s to arrive in Spain, but then they were delayed on the ground. Rota is about 2,000 miles from Benghazi. That's an hour and 45 minutes after the mortar attack that kills Woods and Doherty. They were ready to go but they were still 2000 miles away. And then they had to wait six hours for the C-130s to arrive. If my arithmetic is correct the earliest they could have departed Rota was almost 8 hours after the mortar attack began. And if a C-130 cruises about 300 mph, it would still have to take more than 6 hours to get to Libya. Does retired Marine Jack Kelly really believe that they "could have gotten there" in time to save Woods and Doherty were it not for a 3 hour delay regarding uniforms? Does he think that the C-130 is some sort of time machine? Doesn't anyone at the Post-Gazette (where this poop is published) fact-check Jack Kelly ? If they are, they're doing a crappy job of it. Jack, see ya next week maybe? The investigation into Hillary Clinton's use of private email while secretary of state is closed, U.S. Attorney General Loretta Lynch said on Wednesday, removing a legal cloud that threatened the presumptive Democratic nominee's presidential bid. But the statement by FBI Director Comey is hardly something for anyone on Team Clinton to be happy about. Here's my problem. Regardless of the question of legality/illegality (which seems to have been resolved) my issue is one of judgement on the Secretary of State's part. None of which actually amounted to anything. Ken Starr brought no charges regarding any of them, and the Clintons had nothing to do with either Foster's or Brown's deaths. The haircut didn't cause any delays. And so on. All Bill got snagged for was misleading the OIC about the non-wifey blowjobs. But remember how the GOP and their friends the media (right wing and otherwise) treated each? It's not too much of an exaggeration to propose that if, as Secretary of State, Hillary Clinton were to use the wrong fork for her salad either Larry Klayman and/or Judicial Watch would file a FOIA lawsuit to find out why. Given all that, what was she thinking to even set up those email servers in the first place? And did she think that no one would find out and ask questions about them? Ever? Even if the use of those email servers was completely OK (and again, no charges but the picture Comey painted wasn't pretty) then it was her team's responsibility to make sure that every aspect of their use was beyond squeaky clean. Yes, it's unfair and yes it's a double standard but given her last name and the GOP/media appetite for Clinton scandals, it's completely understandable. Or at least it should have been when they were thinking of setting up those servers. They should have gotten an official OK for every circuit board, every USB cable, every keystroke, everything. They should have done that so that when the inevitable congressional investigation began they had it officially covered. They should have done this beforehand. But they didn't. At the very least they misread and underestimated their political and journalistic adversaries - and that means they didn't learn the lessons of 20 years ago well enough. The Tribune-Review Editorial Board Is Misleading You On Climate. Again. Adding more fuel to the fire over man-made global warming/climate change, a former Greenpeace official says carbon dioxide emissions might well be aiding Earth's environment. Patrick Moore, a senior fellow at the Frontier Centre, a Canadian public policy think tank, reports that 18,000 years ago, CO2 dropped to its lowest level — to the point of actually stunting plant growth. If those levels were to continue at the same rate, carbon-based life on Earth eventually would begin to die, he writes. Fossil fuels have reversed the CO2 decline and likely will foster increased growth rates for plants, including food crops, according to Mr. Moore. Rather than disrupt the environment, human emissions have restored balance, he says. Let's start with Patrick Moore. This is not the first time his name has been wetly plopped onto the pages of the Tribune-Review - we noted his existence there in March, 2014. Scaife's braintrust called him (incorrectly, as it turns out) "Greenpeace co-founder" then. Sadly, he's been demoted to a mere "former Greenpeace official" now. Poor Pat, what's a shill for the nucular industry to do? While it is true that Patrick Moore was a member of Greenpeace in the 1970s, in 1986 he abruptly turned his back on the very issues he once passionately defended. 1986? That's 30 years ago! He hasn't been in agreement with Greenpeace for three frickin decades! That's now long ago 1986 was. But let's get back to what the braintrust leaves out about Moore's "science" shall we? If you thought that 30 years is a long time, 2 million is waaaay longer! For that, Moore says burning fossil fuels right now is a good thing. It'll save life on earth for the next 2 million years. It'll also keep the profits rolling. You might have to take a look at a bigger image to get all the details. It's here. See that last low point? That's what Moore's talking about. See that last high point? Its just to the right of that last low point. That's where we are now - that's where our current climate change problems lie. Moore sees the world's fossil fuel burning as "correcting" the downward trajectory of CO2 (what downward trajectory??) but he curiously omits the fact that CO2 levels are the highest they've been in 800,000 years. When will they be corrected downward? Do you see how nuts Moore really is? Another reason another season for Tribune-Review science denial. I really don't want to have to do this (I'm on vacation, for Jebus' sake!) but here I am pointing out that there are THREE bits of Climate misinformation on the Trib's editorial page today - last two connected and the first an old reused bit of science denialist nonsense. If this feels familiar, it is. It's a cowplop warmed over (pun, get it??) from last December. The sun is in the currently in its quietest period for more than a century. For the second time this month, Vencore Weather claims the sun has gone into 'cue ball' mode, with images from Nasa showing no large visible sunspots on its surface. Predictions from the model suggest that solar activity will fall by 60 per cent during the 2030s to conditions last seen during the 'mini ice age' that began in 1645, according to the results presented by Professor Valentina Zharkova at the National Astronomy Meeting in Llandudno. There it is - the work of Valentina Zharkova. And that's what leads us back to the Trib of last December. This month there's been a hoopla about a mini ice age, and unfortunately it tells us more about failures of science communication than the climate. Such failures can maintain the illusion of doubt and uncertainty, even when there's a scientific consensus that the world is warming. The story starts benignly with a peer-reviewed paper and a presentation in early July by Professor Valentina Zharkova, from Northumbria University, at Britain's National Astronomy Meeting. 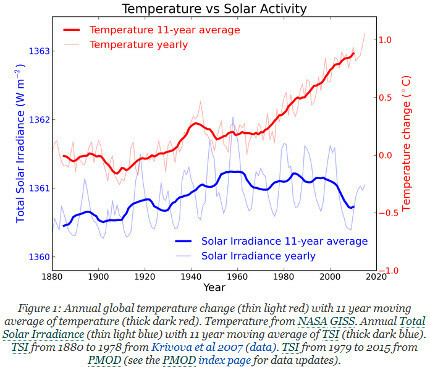 Ask yourself this: given that the number of sunspots goes up and down in 11 year cycles and the temps have been more or less rising for a hundred years doesn't it mean that the two phenomena barely connected, if at all? Now go look at what the Braintrust wrote. See Braintrust mislead. Silly Braintrust. You'll note the mislead - we've seen this before from Scaife's braintrust. See that? Exxon is charged with "...having engaged or engaging in conduct misrepresenting its knowledge of the likelihood that its products and activities have contributed and are continuing to contribute to Climate Change in order to defraud the Government...." not with simple climate change denial. And anytime (which is to say, EVERYTIME) the Trib says otherwise, THEY ARE LYING TO YOU.